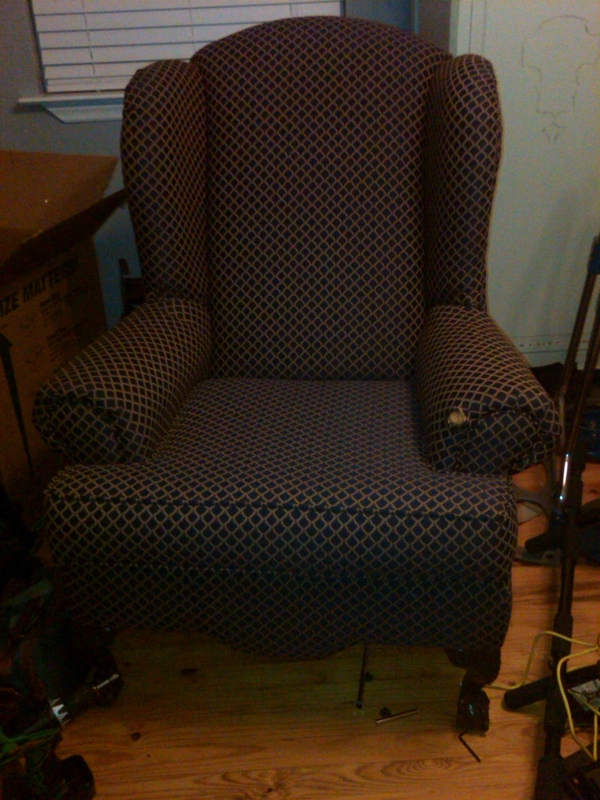 Last night, I tackled the first phase of my biggest DIY project to date – upholstering my grandmother’s beloved wingback chair. I called various local places for quotes and all were roughly $200 – $300. While that doesn’t seem like a great deal of money, added to the cost of covering an ottoman ($50 – $100) and a camelback sofa ($275 – $400), on top of the $400 worth of specialty fabric I ordered from Tonic Living, it was more than I wanted to pay. I know some of you are thinking why don’t you just buy a new one? Or, can’t you continue using the mint condition sofa, chair and a half and oversized ottoman you purchased a mere 2 years ago? My response – no, I certainly cannot. Or, no, I really don’t want to. I love what I have but I bought it when I was in a roomier townhome. Now that I have my own quaint (albeit smaller) cottage, I don’t have as much space. Also, my taste has changed a bit. When I was first out on my own after college, my grandmother gave me a wingback chair that she’d had for years but rarely used. She had impeccable taste so I knew it was expensive and of good quality. The chair had navy and gold fabric with small bits of red. Pretty, but not my style. However, it was free and I learned a long time ago not to reject free things (unless it’s candy from a stranger or something you find in a sandbox). In my new house there just isn’t room for it along with my other bulky living room pieces, so it has sat in the corner of my guest bedroom for the past year as another place to store piles of clothes. I felt guilty every time my grandmother would come over because it wasn’t prominently displayed. She always asked me if it got used. When my grandmother passed away in October, I inherited a camelback sofa (with 6 matching pillows) that my mom claims she’d had for twenty years. It’s been covered and recovered at least five times. I remember it being in my grandparents’ sunroom when I was growing up. All of us grandkids would jump on it and get into pillow fights and use it as a barrier during our war games. For the last year and a half it had been her cozy seat in the living room, where she enjoyed HGTV, The Food Network, QVC and visiting with family. During my visits we would each claim a cushion while we shared stories of new recipes we’d tried, my latest decorating projects and politics (we never could see eye to eye). So now I think you understand why it’s so important for me to keep the chair and sofa. 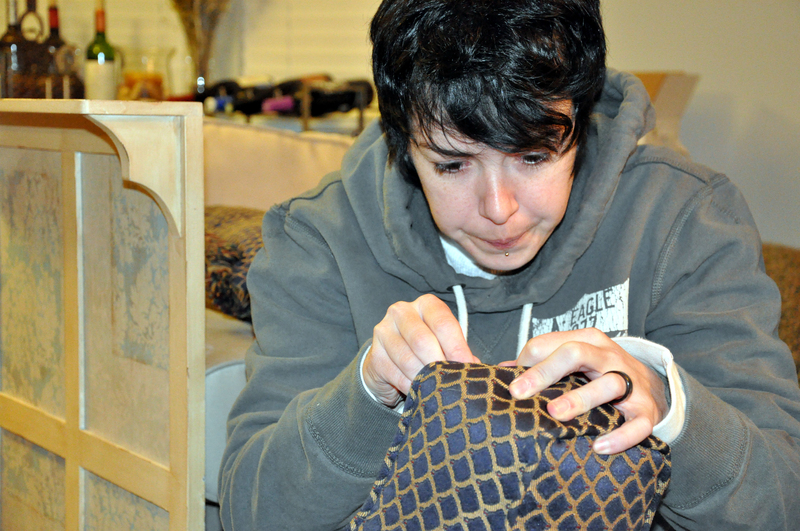 My friend, Kora, is apparently well versed in how to do a lot of fabulous things, one of those being that she knows how to upholster furniture. When I was venting to her about the cost of this project, she offered to help. Now, I must admit when she first told me this I assumed it was something similar to Phoebe’s ridiculous “I can be a bear cub” statement (if you don’t recall this Friends reference, I’m very disappointed and urge you to buy the box set. Or at least watch reruns on TBS). I was weary to pay so much to get someone else to do it and I know that if I want something done perfectly, I might as well do it myself (I have trust issues, I know). 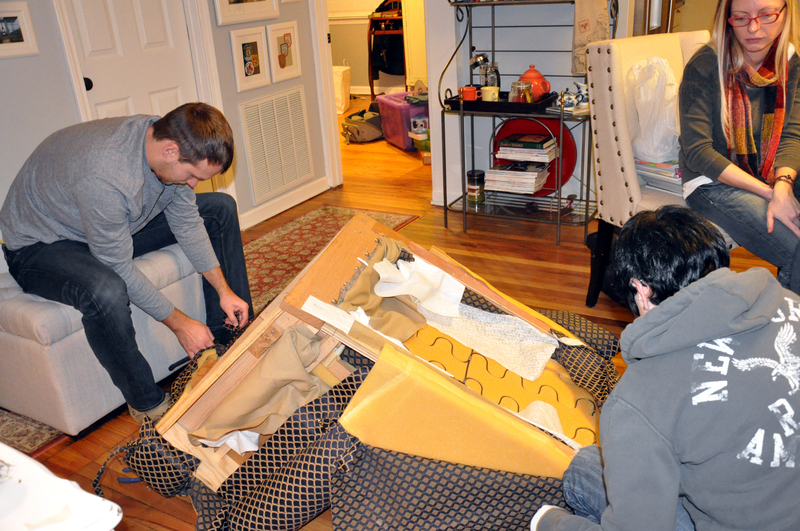 So last night, Kora, Amy, Elliott (by force), and I began phase one of the upholstering project. She said she’s not going to do it all herself and I actually love learning how to do new things on my own, so I am her eager apprentice for the next few weeks. They arrived around 6:30 p.m. and I had dinner ready – spicy shrimp and feta pasta, wine and salad. One thing you should know, whenever someone helps me with a project, they get free food and free booze ;). While we ate we laughed at Sheldon’s absurdly genius anecdotes during an episode of Big Bang Theory and then got busy with our project. After the first few minutes of seeing Kora in action, I was quite impressed. She began using tools I’ve never even heard of like jaws of life prying staples from layers of fabric, foam and wood. She’d riddle off duties for the other 3 of us as we looked at each other with contorted, confused faces. While she removed staples, Amy and I carefully used a razorblade to tear the seams in the pieces of fabric. Then, according to her very specific directions, Elliott would use masking tape and a red sharpie to label each piece – seat cushion, inner arm left, inner arm right…you get the picture. In the midst of all the ripping and prying, I decided I wanted to hear Kora’s tales of jobs past, so I asked about her other 26 odd jobs. When she wouldn’t offer up all the details, I probed until she did. She asked if I was conducting an interview. I jokingly replied, “You’re already doing the job I’m hiring you for – and you’re free!” We all laughed. Seriously though, the more I learn about this chick, the more I am fascinated by her many talents. By the end of the night, the chair was naked and there was a mason jar full of old staples and layers of properly labeled fabric. 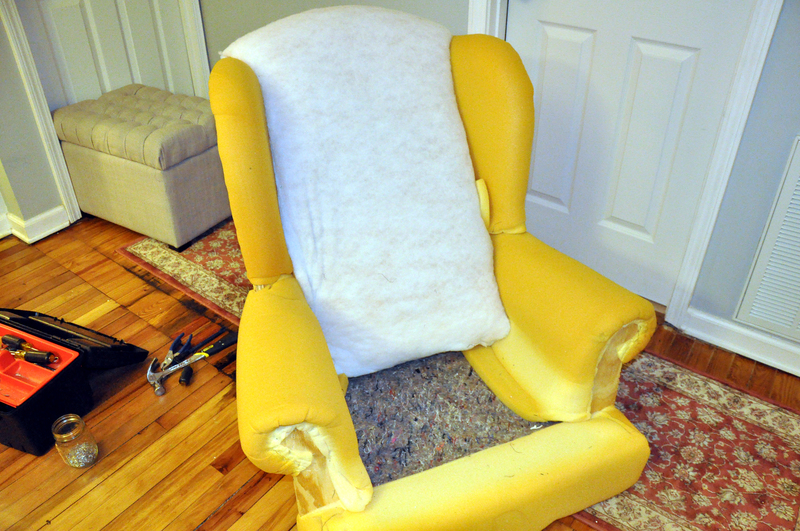 Chair Upholstering Project – Phase One ended around 10:30 p.m. I’ll be sure to post the other phases as they happen! 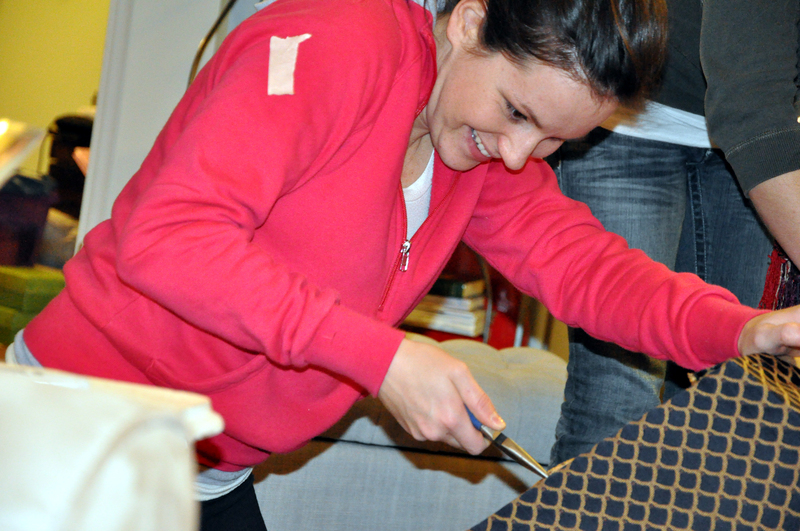 This entry was posted in Furniture builds & remodels, Uncategorized and tagged DIY, how-to, upholstery by rue3twenty2. Bookmark the permalink. Awesome! It’s so nice to have friends who know how to do stuff and are willing to help 🙂 Can’t wait to see how the rest of it shapes up!